This property has been constructed with a shared side path and side doors to reduce plot width saving land costs. The walls are solid and will be cold. The property also has an angled ceiling in the annex again to reduce the expense of constructing full room height walls. The angle is unlikely to be insulated and will be cold and prone to condensation. It may be possible to push rigid insulation down from the roof void. Stuffing soft insulation into the angles should be avoided as it prevents ventilation encouraging condensation. Our Redditch RICS Chartered surveyors were unconcerned by a solider arch that had dropped as it was probably due to historic foundation movement and as the bricks drop they jamb tightly together thus repairing the arch. Our property surveyors were much more concerned by a leaking downpipe as the water can easily soak through the solid walls. Large escapes of water can trigger dry rot decay. Our property surveyors were also alerted by a missing chimney breast. Most pre WWII reception rooms have a chimney breast. The lack of one in this room may be indicated to our property surveyos that the first floor attic chimney breast is no longer supported. Our surveyors have at least thirty years experience of preparing residential building surveys, homebuyers surveys and valuation surveys in Redditch and the greater Redditch area. We are also highly experienced in as Independent Experts for residential property in Redditch in respect of matters such as valuation, boundaries and construction disputes. Specializing in residential property surveys and valuations has inspired confidence in a wide range of clients including individuals, large and firms of solicitors in the Redditch and greater Brimingham area. Chartered Surveyors Redditch are fully qualified MRICS members and Registered Home Inspectors and RICS Regulated Valuers ensuring the practice complies with exacting standards. Our surveyors can invariably visit clients in the Redditch area the same day or next day, at the office or home. 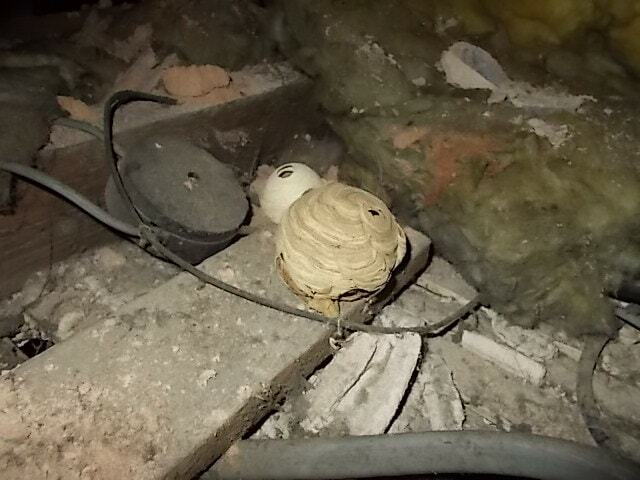 Redditch Wasps nests discovered by our Chartered Surveyors during a Redditch Homebuyers Survey. These are only small examples, completed ones can be about as big as a football. They are no harm to the property and can be left unharmed unless the wasps are actually causing a nuisance, although most people never know that they have been there. The become extinct in winter and the Queen moves on. A Homebuyers Survey and Report by our Chartered Surveyors noted a missing earthing wire in Redditch. The pipes under the boiler should have a cable with green and yellow sleeve connecting back to an earth. Lack of earthing makes it dangerous to use metal light fittings or switches and is likely to be indicative the system is dated or installed by an amateur. Surveyors in Redditch came across this original 1960's door on a Homebuyers Survey in Redditch. Our Chartered Surveyors advised that the glass was not toughened and poses a risk to anybody falling against it. All glass doors and glass panels below 80cm from the floor fitted in properties today have to have toughened glazing panels. Corroding Steel in Redditch. Rust discovered by our Chartered Surveyors on a Redditch Homebuyers Survey and Report. The rust is caused by corrosion of the steel beads used to give the external render a straight edge. The rust may eventually force the render off. Unfortunately the only way to remedy the problem is to remove the angle bead and insert another which is not expensive. 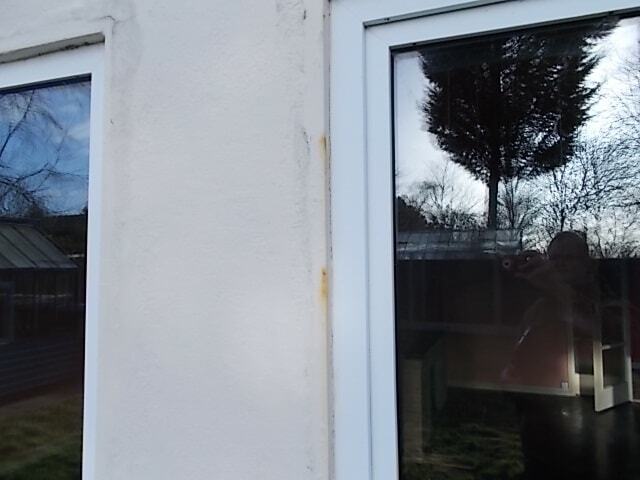 However most would than want to repaint the unsightly patch repair of the render and it then becomes necessary to paint the whole elevation for a satisfactory finish. 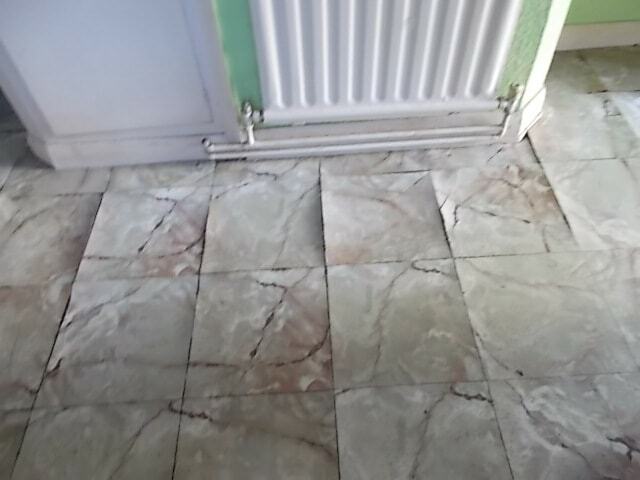 Lifting thermoplastic tiles were noted by our Chartered Surveyors during a Homebuyers survey in Redditch. Our surveyors always treat lifting thermoplastic tiles with suspicion as they may be caused by dampness. There appeared to be an impervious membrane under these tiles suggesting that they are lifting due to poor bonding or a water spillage.